Heat oven to 450°F. Lightly oil 16x11-inch roasting pan with 1 tablespoon olive oil. Arrange garlic, onion, Brussels sprouts, potatoes and sage leaves in pan. Sprinkle with salt and pepper; toss. Place pork loin over vegetables. Season with salt and pepper. Top vegetables and pork with bacon. Roast 30 minutes, tossing sprouts and potatoes every 15 minutes so they roast evenly, or until meat thermometer inserted in center of thickest part of pork reads 145°F. Remove from oven; place pork on cutting board. Cover loosely with foil; let stand 8 to 10 minutes. Return pan with vegetables to oven; roast 10 minutes longer. Cut pork into 1/2-inch-thick slices. Serve with roasted vegetables. To reduce to roasting time, you can cut the vegetables and the pork into smaller pieces. 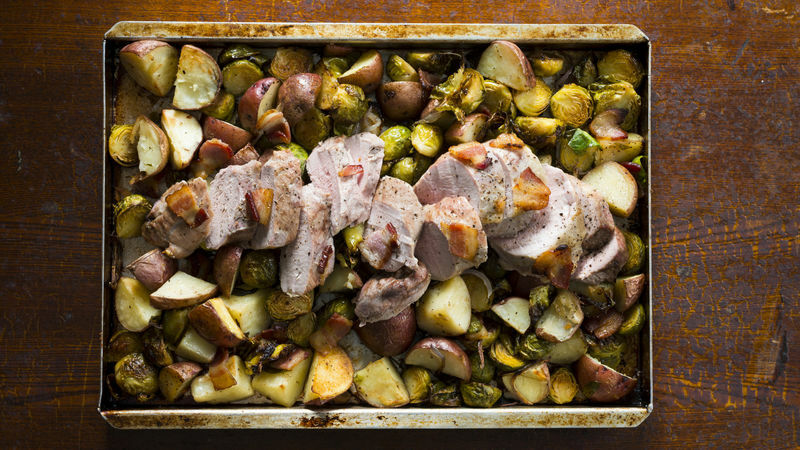 Cut the Brussels sprouts into 1/4-inch slices, cut the potatoes into 1/2-inch cubes, and cut the pork loin into 1/2-inch-thick slices. You can then shorten the roasting time to 20 to 25 minutes and eliminate the resting time for the pork. It is important to let roasted meats rest before slicing so that the juices in the meat can redistribute themselves throughout the roast. If you slice the roast prematurely all those flavorful juices will just run right out onto your cutting board. Also, the roast actually continues to cook after being removed from the oven. Tent the roast with aluminum foil to keep it from cooling down while resting. If you’re not a fan of Brussels sprouts, you can substitute cubed butternut squash.